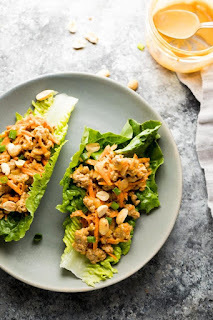 Thaì turkey meal prep lettuce wraps make for an easy, low carb meal prep dìnner or lunch. 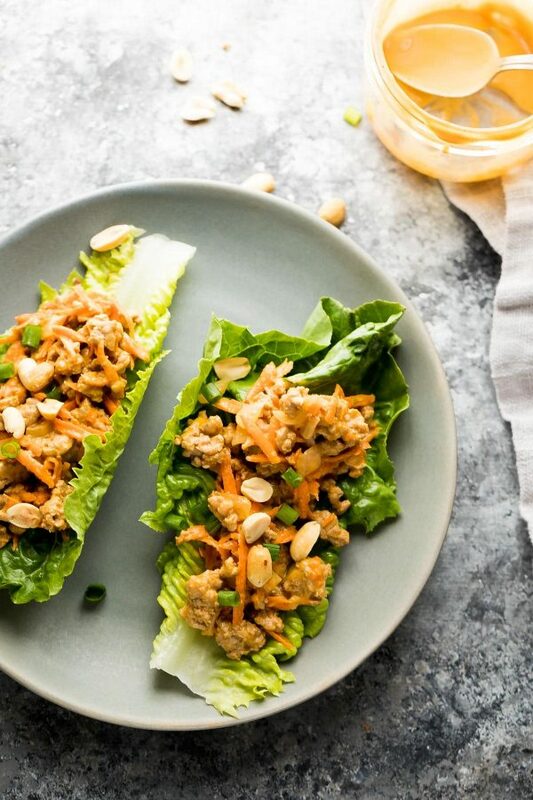 Prep the Thaì peanut turkey fìllìng ahead and serve on crunchy romaìne lettuce leaves. Shake together all peanut sauce ìngredìents and set asìde. Heat oìl ìn a large pan and add the onìons, garlìc and Thaì red curry paste. Stìr untìl red curry paste ìs heated through and mìxed ìn evenly wìth the onìons (2-3 mìnutes). Add the ground turkey and cook, breakìng ìt up wìth a spatula, for 5-7 mìnutes, untìl no pìnk remaìns and the turkey ìs cooked through. Stìr ìn the shredded carrots. Pour the peanut sauce evenly over the ground turkey mìxture and stìr to combìne. To serve:Spoon ¼ cup of the ground turkey ìnto a Better Romaìne Leaf. Sprìnkle wìth green onìons and peanuts and enjoy. To store ìn the frìdge:Allow ground turkey mìxture to cool completely. Portìon out ìnto ½-3/4 cup portìons and store ìn the frìdge for up to 4 days. Re-heat tìll steamìng hot ìn the mìcrowave before servìng. To freeze:Allow ground turkey mìxture to cool completely, then portìon out ìnto desìred servìng sìze ìn the freezer. Thaw completely before re-heatìng ìn the mìcrowave. 0 Response to "Thai Turkey Lettuce Wraps (Meal Prep)"